Petite sirah: small berries, big wines! Just when I thought wine was giving me a break, it surprised me (again!) by adding durif to my journey of discovery. It’s not that I’ve never heard of durif (or petite sirah), it’s just that I’ve never had the pleasure of experiencing this bold red wine. Until Sunday at the home of Ayama wines in the Voor Paardeberg. But let me explain. Petite sirah (or durif as it’s known locally) is a robust red grape that produces full-bodied red wines that was developed in the 1880s by Dr Francois Durif of France from a syrah-peloursin cross. At the time the experiments were taking place, Dr. Durif was searching for a way to make syrah more resistant to powdery mildew. My introduction to petite sirah! Big, bold and a bit abrasive, but what a wonderful partner to food. While durif never became popular in France, it was not long before petite sirah found a home, first in California and later in Australia. In California, growers began planting the grape as far back as 1884. The grape began appearing in Australia by 1908. Popular in California, petite sirah is also cultivated in Argentina, Brazil, Mexico, Australia and SA. It is said the only small (petite) thing about durif is its berries. It produces intensely coloured, tannic red wines. 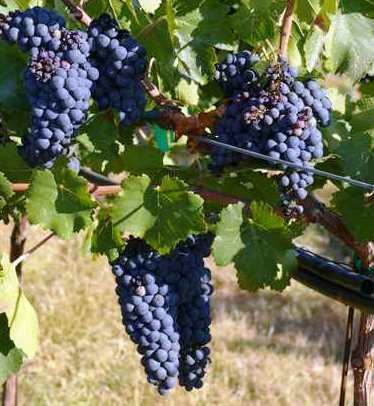 Petite sirah should not be mistaken for petite syrah, the latter being a small-berried clone of the syrah grape variety. More than 35 other names for durif exist internationally. Almost 114 hectares of durif is planted in SA, first established at Vititech in 2001. The first commercial planting was established in 2004 on the farm Fairview near Paarl. Most of the plantings are in the Breedekloof and Paarl areas. New plantings were done in 2016. The sturdy durif vines can survive in a variety of soil types and show vigorous growth and yield of up to 24 tonnes per hectare. The vine has a tendency to creep so trellising is preferred to keep the bunches off the ground. The grapes are harvested mid-season. Durif is not only used to make full-bodied red wines, but also in blends where it adds tannic structure and colour complexity. Durif (or petite sirah) produces inky dark, purple coloured wines that offer flavours of black pepper, blackberries, blueberries, spice and licorice. These wines are often massive, intense, chewy and masculine, and, when they are young, provide massive amounts of tannin and high levels of acidity which enable them to age for decades. Like many single varietals, petite sirah is best when the fruit comes from old vines. Old vines give the fruit incredible concentration and density of flavour! Old vines are important for another reason for petite sirah (or durif) as the grape is prone to high yields when young, unless it’s cropped back. Petite sirah makes a powerful, fruity, hardy, dense and often tannic wine which really pairs perfectly with a wide variety of equally big dishes. Meats, stews, braised and grilled meats are excellent food and wine matches, while short ribs, hamburgers and barbecue of all types served with petite sirah also work as good food and wine pairings.